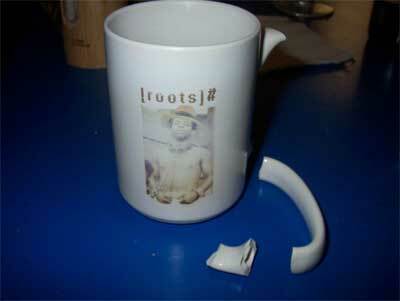 It is with great sadness that I report that my [Roots#] mug has held its last cup of coffee/tea. Last night, as I did the dishes, a water glass broke free from my grip and hit the mug right on the handle breaking it clean off. Paul got me the mug nearly five years ago after I'd been admiring some of his artwork that inspired the L&E Geek Chic: Geek Shirts That Only Make 80% Sense product line for some time and Paul ended up surprising me with the mug. Bruce Campbell posed with another mug from our product line. These were potentially the only two items every purchased from our store. 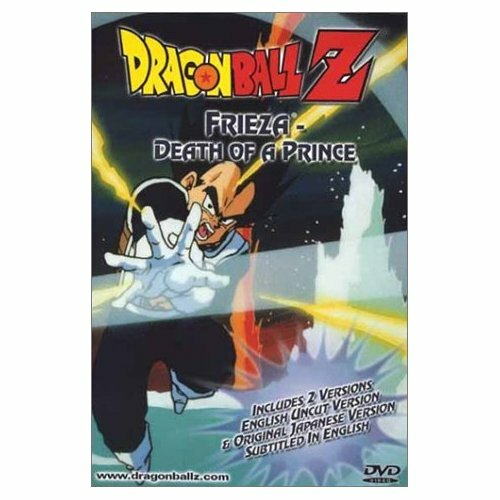 How my mug's death would have looked if my mug were Vegeta and the glass I dropped had been Freiza. 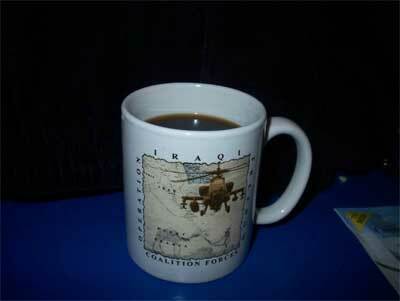 With my mug -- which had been my sole carrier of hot liquids -- dead, I'd have to search for a new mug. Previously my mug of choice had been a mug that I'd gotten from a local Chinese restaurant which used to bring me gifts for being one of their first customers. That had been my exclusive coffee mug for about 5 years as well. The grizzly scene after doing the dishes. Now that my mug was busted I had to choose a new mug. My instinct was to go out and find a great mug to purchase to replace that mug. However, in an effort to live greener (and I hate to use buzz words), I decided the best move would be to look no further than my cupboard for the replacement. I had read somewhere that it takes somewhere in the neighborhood of 1,800 repeated uses of paper cups to equal the same 'environmental damage' done by just one ceramic cup. In the long run, ceramic cups are the 'winners' of the green war but reuse of a ceramic cup is not nearly as much better than paper cups for the environment as one may think (sorry for that sentence). I figured I'd used my [roots#] mug an average of 1.5 times per day for 5 years (that's 2737.5 times!) so I'd done my part to make sure Manhattan doesn't get flooded by the rising sea. As for replacing the mug, luckily I'm a human being and that means that I have accumulated far more coffee mugs than I will ever need in my lifetime so I had plenty of options to choose a replacement. I had a lot of mugs in the cupboard that I'd had for years but the runaway favorite happened to be a young lieutenant which had quickly moved up the cupboard ranks. He was the newest member of the team who had been given to me about six months ago by a friend who had returned from Iraq (and has since left for Iraq once again). A new chapter. A new beginning. A new beginning chapter. Of a book. About coffee mugs, that is. "Why," you ask. "Must you use just one coffee mug? Why can't you just grab any mug and use it." Well, that's simple. It's because I'm slightly (largely?) compulsive and I have to have my coffee/tea out of the same mug every day. I can't even wrap my head around the idea that I would have to use a different mug every day. Now every time I sip my coffee I can think about what is more damaging to the planet and wasteful: An ongoing war in which billions of dollars and tens of thousands of lives are wasted or a ceramic mug commemorating it? That mug is awesome, don't drink out of it. One day it will be collectors items. I'm still hitting myself over destroying/losing all my Gulf war trading cards from the early 90s. So theres no way you can attempt to repair it with like tile solution? I found this solution but I don't know if it will help considering the heat and pressure on the handle. Me, I use heat resistant cups for hot drinks. I don't know whether pyrex glass cups use much environmental resources as for the sand and other chemicals compared to ceramic cups. I have never broken a cup before apart from thin glass cups. I feel your pain Chefelf. I had been using the same ice cream dish for almost as many years as you've been on this earth. It was an old plastic container which in its former life held margarine I believe. In any event, this container was the only one I felt comfortable eating ice cream out of. If it was in the dishwasher, I had to pick something else to eat from. I never really knew how much ice cream to place in it. Was it too much, not enough, just right. With the plastic container I always knew. I was safe in the knowledge that as my arteries closed, I was happy eating from my dish, every night, at 9:30, me and my bowl of ice cream. My father sat in his favorite chair every Friday night watching the Gillette Cavalcade of Sports on television. Your uncle Sonny and I would sit each on one lap and he would eat his favorite candy bar (Mounds). My mother would buy a package of them every week just for him. That would be the only time I ever remember seeing him eat them. It was his special end of the week treat. There we would sit, every Friday night, before we went to bed. One for me, one for Sonny and one for him. Compulsion or ritual? I am now attempting to shed some pounds so I can look buff at your upcoming nuptuals. I don't eat ice cream every night. Now it's a small cup of Yogurt instead. I still have that beat up plastic bowl in the cupboard. Everything is right with the world. But really Chefelf, a coffee mug obsession, that is just plain weird. I don't think you're supposed to have coffee and ice cream at the same time. Gallstones or something. So maybe we shouldn't be discussing them in the same thread. You know, to be safe. I'd go a long way for my obsessions. I wouldn't mind paying extra for a tailor to repair or refurbish one of my old ragged plain shirts I wore over ten years ago. If you are obsessed why not make repair attempts? If that fails then it could be a standing decoration. And to think I ever wondered about Nate's compulsiveness ... Little did I know he came by it more than naturally! May I say that Vanilla yogurt, fresh berries and vanilla crunch yogurt is one of my favorite nightly treats. Häagen-Dazs 1/2 fat ice cream is also good but not as good for you as zero % fat yogurt i suppose. I've had my green Coke glass for ages. Actually, I lie, there were three, but they are/were all much loved. You know the sort, green with wobbly bits. The first came years ago, with some Coke, I think. The second was much bigger, and came from a crappy bar/tapas bar down the road. It was much loved... until I dropped it into the sink and shattered. The third was stolen on a pub crawl round centeral London, and I was livid when I came back from Easter to find it being used... as a vase. The fourth is yet to come, and will involve stealing another big glass. There was also a small, thin, non-green French one. Which obviously remains unused, and possibly lost, to this day. BTW: I forgot to mention that I still have all of mine. Its nice to see that other people also feel emotionally attached to their inanimate objects. I remember that mug! This is truly a great loss! My main mug is the same Teenage Mutant Ninja Turtles mug that I have adored since I was a lad. I've been using it consistently for over a decade, and it's still holding strong. I should add that I still think your dad is awesome. Oh one of my favorite drinks for a while when I was in college was a scoop of french vanilla ice cream with a double espresso dumped over it... cream goodness is all I can say. I feel your pain Chefelf. I had been using the same ice cream dish for almost as many years as you've been on this earth. I had the most awsome translucent dark blue bowl that had this detachable silver lattice work frame. my lawyers advise me not mention what this bowl was most comonly used for, but needles to say it's use led to the consumption of ice cream. The only thing more heartbreaking than when my girlfriend at the time dumped me, was when she accidentally broke this dish by knocking it out the window. she hid the evidence and waited nearly a week before confessing. i accused her of being jelous of the bowl, for its beauty shadowed hers. ...hmmm. our arguments were always so intersting in retrospect. I kind of miss her now. and what the hell happed to all my star wars cups from the movie theatres?